Ask your average youngster what Easter is all about and he’ll tell you about the Easter bunny, and finding Easter baskets filled with grass and jelly beans and a big chocolate Easter Bunny. He’ll tell you about those pastel foil-covered chocolate eggs and Reeses eggs and Cadbury eggs. And, of course, there are Easter eggs to dye and flavored jelly beans and those sticky marshmallow bunnies. But is that what Easter is really about? Jesus is Risen this day which gives us all cause to celebrate. Enjoy the chocolate, but reflect on the reason for this wondrous spring holiday! 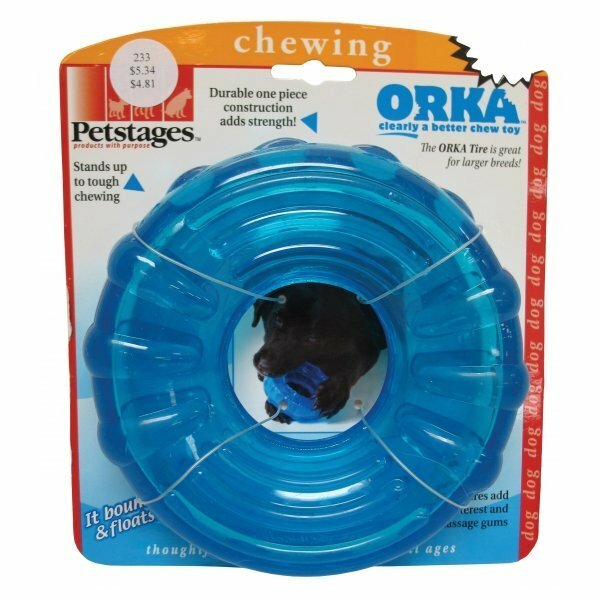 Designed for dogs that love to chew, PetStages ORKA chew toys are made of a durable, non-toxic, synthetic rubber that combines fun and function in one toy. By providing a dog with an appropriate chew object, owners can help reduce a dog’s boredom and destructive behavior. Click here for a listing of all ORKA toys, with pictures and comparison pricing. Orka dog toys consist of the Orka Tire, Orka Flyer, Orka Tennis ball, Orka Jack (both large and small), Orka Jack with Rope, Orka Pine cone chew, Orka stick, Orka Dental Links, Orka bone and teh Orka Jack with rope (small). Petstages Orka brand also consists of mini Orka toys that address the needs of the smaller breed dog. Splurge a little on your Dog’s Birthday! Isn’t it the truth? The best way to make your dog happy is through their belly! It’s Fido’s birthday and you just don’t know what to get him! Either with food and treats or a good, old-fashioned tummy rub. Natural dog food and treats are the specialty at Three Dog Bakery – and boy do they have a great selection of that specialty. No doubt, Three Dog has some of the healthiest and most fido friendly treats and foods on the market. In addition, You Lucky Dog you, use the coupon code and click through the banner on the right to activate a discount of free shipping on orders greater than $55. The ingredients make the difference in dog treats and food — using healthier ingredients means healthier, more energetic dogs. All natural dogs deserve all natural dog food and treats! Take a minute to read more about Three Dog individual ingredients and learn how they lead to happier, healthier dogs. Happy Birthday, Fido and all you other dogs out there! YOU LUCKY DOG, YOU – CLICK HERE NOW TO ACTIVATE! Everything I need to Know in Life, I learned from my Dog! If you want something, look at it until you get it or it’s gone. Take every opportunity to run. Take every opportunity to nap. Never pass up the chance to snuggle. Listen attentively and don’t offer solutions. Be brave, optimistic and completely present. Give and accept love with every breath. The largest online pet business directory – www.Petazon.com announced it’s 10,000 business has joined the directory! Businesses in all areas of the pet vertical are allowed to market their companies online for free at Petazon. The directory is designed in a category / sub-category manner which allows visitors to find companies in a specific pet area. For example, some of the most popular categories include Pet Sitters and Dog Supplies. Business owners in all 50 states are represented and in all areas of business related to pets. The directory also boasts a huge online price comparison area for visitors to find pet supplies at rock bottom prices. If you own a pet – visit www.Petazon.com and bookmark it. You will find pet businesses that really care about your pet. If you are a business owner – don’t hesitate to create your free listing and get more online traffic and/or foot traffic to grow your company! Do a good deed today and let your vet, dog walker, dog trainer, local aquarium store owner or anyone in the pet vertical know that listing on www.Petazon.com is FREE to all businesses in the United States. The Pet Business Directory boasts millions of hits per month and has grown exponentially since it’s inception in 2004. Pay it forward and let someone know! You never know what you will get in return! Canine Genetic Analysis – sounds intense … really, why should you determine your dog’s breed … is it useful? We think it is. target behavior training for the dog through his or her life. plan exercise activities that make the dog happy. Some dogs are genetically pre-dis-positioned to enjoy water more, hunting activities, toss and catch – etc.. The tests are easy to use and Wisdom Panel provides owners with an easy to read, detailed report on the dog’s breed – it’s fun and it can be very informative. Many vet’s are recommending testing because it makes it easier to understand treatment options when necessary. If you have a mixed-breed dog, this test is for you. Reveal the breeds..
Wonder if, or think, you have a purebred dog but don’t know for sure? If you have a Designer Dog but unsure if he/she is really a cross between.. The most advanced Canine Genetic Analysis exclusively available..
Mars Veterinary is a division of MARS® Incorporated, a company known for innovative consumer and pet food brands that are trusted by people around the world. The mission at Mars Veterinary is to facilitate responsible pet care by enlightening pet owners and communities with valuable insights into their pets as individuals through innovative, science-based discoveries. Pet ownership has many benefits that many of us wouldn’t even consider. Petazon – the Pet Supply Price Comparison Engine promotes pet ownership! Pets can cheer you up with a lick and a wag! Senior citizens that own a dog frequent their doctor less than those that do not own a dog. Daily activity levels of seniors that are not pet owners deteriorated faster than those of pet owners. Pet owners have lower blood pressure and cholesterol levels. Children that own pets scored higher on empathy and pro social orientation scales than non-pet owners. Positive self esteem within children is enhanced by pet ownership. Pet owners have higher one year survival rates following coronary heart disease. For a more detailed listing of this information and other relevant articles visit the Delta Society which is an organization that promote human health improvement through service and therapy animals. As a pet owner myself who has experienced the joy of pet ownership I can say that I am not entirely surprised by these results. It’s well known that our own personal happiness has definite effect on our physical well being. Pets can certainly provide the companionship and love that boost self esteem and psychological well being. We are not trying to hide it – Petazon is working hard to develop a lively and interactive facebook community and if you are pet lover or a pet business owner – we want YOU to be part of it. Petazon.com is a directory that offers free listings and other marketing opportunities to pet related businesses throughout the United States. If you are a vet, own a dog walking company, breed dogs, own a pet store, are a pet sitter, horse transporter or dog ID tag maker – you are welcome to join for free. But that’s not all – any business owner within the pet industry is welcome to join our tens of thousands of members. In addition to the directory, Petazon maintains a pet product price comparison engine that is very popular among pet owners. It allows them to find the lowest price across many online pet supply stores. So .. go ahead and give us Petazon on Facebook a LIKE – we will be sure you are glad you did! Millions of happy dog owners around the globe are using a unique innovation from Germany: the Fleixi retractable dog leash. Spring has Sprung (almost) – get your new retractable leash now! This is not surprising as Flexi stands for the most enjoyable walk for both pet owner and their best friend. 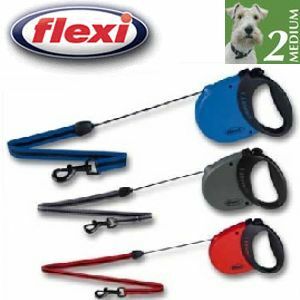 The Flexi one-hand brake system helps you quickly and easily restrain your dog. Everything you could want in a retractable dog lead – durable construction, a smooth, quiet, reliable retraction mechanism that works every time, tough braking system, comfortable fit, and a safety loop to use in addition to your pet’s collar. You’ll notice the superior engineering the first time that you use this lead — after that you’ll just take it for granted and enjoy walking your pet again and again. Your pet has only the amount of freedom you allow and control without feeling restricted. You can brake easily and assuredly at any moment to keep your pet safe. This dog lead is a classic must-have for anyone who likes walking their pet.